Got up real early and worked on updating the website till around noon, then sat with some hungover college students at the counter of a popular local diner to carb-load up, before hitting the road for Indianapolis. Bike chain was strangely loose today, with lots of slack, so a little concerned about that. Still doing its job, though, so I’ll just have to keep an eye on it. With the late start, only got in 40 miles to Lebanon, IN. Not a campground to be found as the sun started to sink in the sky. Considered pitching my tent in the city park, but thought better of it and grabbed a motel room instead. 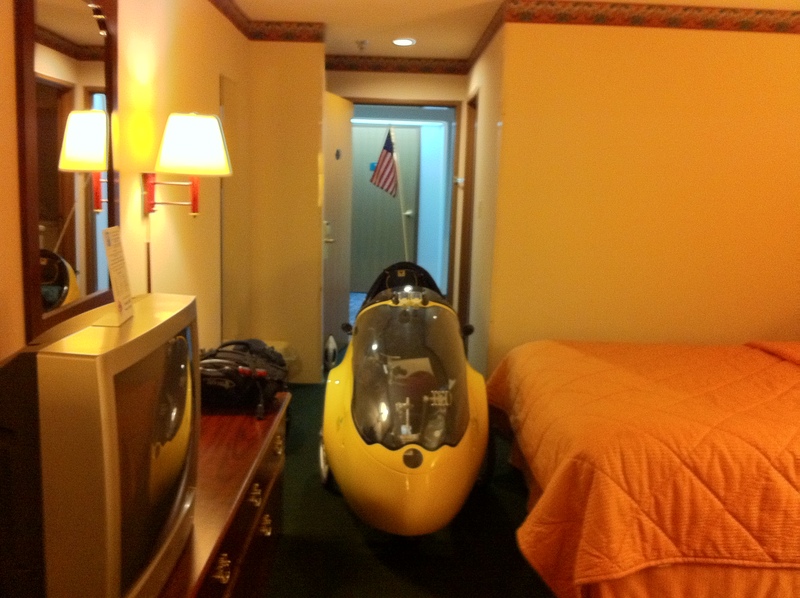 As you can see, it’s tight, but the rocket trike fits. Looking forward to a good night’s sleep, with no trick or treaters knocking on my door. This entry was posted in 2010 Ride, Blog and tagged halloween, indiana, lebanon, ride for renewables. Bookmark the permalink.